This year has been action-packed, to say the least. Susete and I made a decision to pull the trigger on building a dream, as I quit my comfortable job at a successful restaurant, to start down a path to developing our own business. Although my wife is Portuguese born, I wasn’t born there, didn’t grow up in a Portuguese community, or have any Portuguese blood in me. As I mentioned in the beginning of this series, there’s nothing that annoys me more than someone who is not from a particular culture who’s travels to a country for maybe only 5 days, then comes back to open a restaurant claiming to be an expert on that country’s culture and food. Really, it’s just insulting, to both the customers and to that said country and people. 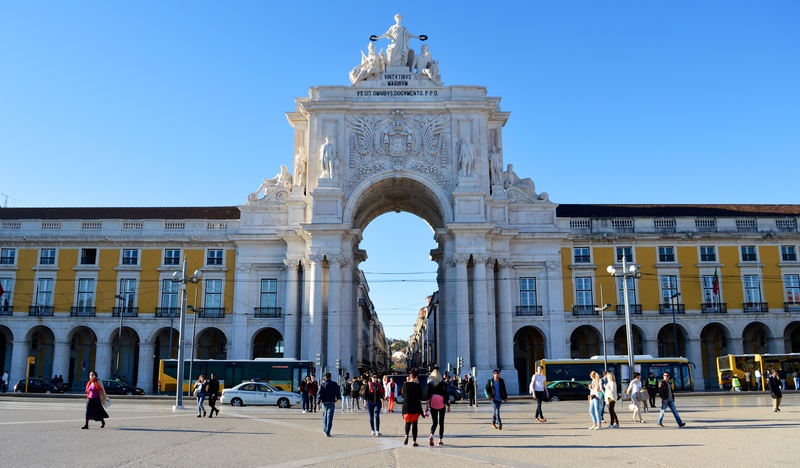 This is a big reason why I felt that it was necessary to make two trips to Portugal, to get to know, in depth, the food, culture and history of this ancient Iberian nation. Admittedly, even though I’ve cumulatively now spent quite a bit of time in Portugal, exploring and learning as much as possible, there are times I still don’t feel like it’s enough to truly do it justice. I am a quick learner though, and as Susete pointed out, when I get interested in something, I throw 110% of my mind and my heart into it, and this is what I’ve done with Portuguese gastronomy… and frankly, I’m still learning, and I will always be. You can never know everything. It wasn’t enough for me to simply open some books or get on Google and learn some recipes. That’s a cop out. Recipes, I can learn anywhere. Recipes, I can learn at home in Toronto. Recipes are the easy part… but only a small part. I once read in Joe Bastianich’s book, “Restaurant Man”, that he and his business partner, Mario Batalli tell all their cooks that they can never TRULY understand Italian cuisine unless they go to Italy. He and Mario can teach them how to cook, they can teach them their 5 star recipes, but these young budding chefs can only really absorb the true essence of the food in the homeland. Taking a lesson from this, I realized that although we have a large Portuguese community in T.O, the only way I can truly understand the gastronomy of Portugal, is to go there… spend time there.. see the sights, learn the history, meet the people, be totally immersed in the culture. You see, a cuisine is much more than its recipes. Portugal’s cuisine is built from layers of history… centuries of tradition. It’s a sum of all the civilizations, and people that have added to it over time. It’s a melange of ingredients from all over the world, brought to one place by fearless explorers who dared to achieve out what others told them what impossible. It owes its heritage to both, periods of amazement, and periods of darkness. It’s the result of the brightest innovations and the most incredible tragedies. Its the joy of world cultures coming together, and it’s the evil of slavery. It’s the best of humanity, as well as the worst of it. As a research trip, this has definitely been a big success. I’ve learned what I’d hope to learn, while also being treated to so many unexpected surprises. The history of Portugal runs so deep, and the culture is so much more complex than anyone really gives it credit for. Portugal is much more than Ronaldo and rotisserie chicken. The people are some of the most hospitable I’ve ever come across, and the cuisine is so full of honesty that it hurts. It hurts to know that we have access to so much, but wonder why are we so behind Portugal (and much of Europe) when it comes to environment and food politics. Why do they care so much more about quality ingredients than we do? Why do I have to feel so stupid when I mention the word “organic” to a Portuguese chef or farmer and they look at me like I’m an idiot because there is no label in Portugal, everything is just that way anyways. While so much of the western world sees this country, constantly in the shadow of Spain, as an old, poor, out of date nation, I’ve learned that it’s so rich in flavour and life. Portugal does hold dearly into its traditions, but it’s also the home to some really great innovation, and there’s been more than one occasion where I’ve felt that it would put Toronto restaurants to shame. This trip to Portugal is my second one this year, and the 3rd phase in my journey to building my own restaurant. Throughout all of this, I’m lucky enough to have a wife who not only introduced her food and culture to me, but also who supports me unconditionally in this often anxiety-filled adventure. Someone who’s willing to take this kind of ride with you, make sacrifices and deal with all the uncertainty and ups and downs, is truly a rare thing to find in another person. I’m lucky to have some other great friends at home in TO, supporting this project, who believe in my abilities as well as the concept that we are trying to bring. I’m lucky enough to have Phil join me on this trip to learn more about a culture and cuisine that was completely foreign to him. It’s a special thing to have a colleague learn what you learn, know what you know, and experience what you experience. It’s hard to explain, and perhaps it’s something that only chefs can understand about the affect it has on us, to have another chef “get” what we “get”. In addition to those close to me supporting and encouraging me through this journey, I’ve also been lucky enough to meet and make new friends in the country that I’ve come to love so much. Luis, from Cooking Lisbon (in Lisbon, of course) has been a great friend as well as a great help in making things happen in Portugal. Luis introduced me to Rui, the pig farmer who not only let me into his world and taught me inner-working knowledge about the the best and most expensive pigs that money can buy, but also treated us with such respect and hospitality that he had also become a friend and not just a resource. The Dançante family in Alentejo who started out simply as accommodation hosts, gave us so much of their personal time. Gina and Amilcar (the parents) enthusiastically spoke with us giving us stories of the their lives in Portugal’s heartland, and the history of their region. They shared their art, their music, and their coffee! (which always gets my). The girls, Diana and Mafalda, met up with us to hang out, which at first sounds like an everyday thing, but in the context of the purpose of our trip, helped to give us so much insight on the current generation of Portuguese. How the youth people there think, what they do, what are they’re hopes and aspirations in a downtrodden economy. It helped us learn what’s “now”, when all we really have to learn in Toronto is what might have been 50 years ago. Joao, the chef in Évora, let us in on his history in the industry, as well as his thoughts and insights as to the future of Portuguese cuisine. The bartender at Mini Bar, the bartender at Red Frog, the servers at the countless places we ate….. and the cooks at O Beco… those two women in that tiny kitchen who opened up my mind to this cuisine from the very beginning. So many people have inspired me along this journey, and after learning my story about what I’m doing, so many of them were in turned inspired and overjoyed at the fact that I’m so passionately trying to learn their culture and food, and spread it outside of Portugal. That I wanted to get to know the real Portugal, the stuff that’s not in travel books, but only in their hearts and minds. It means a lot to know that your big idea is being appreciated and supported…. especially by the people who are the inspiration for it all. Saudade (the Portuguese concept of missing or longing for something) is a very real thing, and I’ve really learned what it is, as I sit on the plane on my way back to Canada. The only thing I can do now, as I return home, is to drive forward to achieve what we’ve set out to achieve. The only way I can repay everyone who’s helped and taught us so much during this trip, is to honour their lives, their culture, their food. We have lots of Portuguese restaurant in Toronto, but we really don’t have Portugal’s soul. We don’t have all its history or any of its innovation. This is what I hope to bring even a little bit to our city… a city that is so open to learning new cultures and new experiences. The chefs, the farmers, the business owners, the students, the parents, the people of Portugal…. I’m bringing them all home with me, and will share them with our great city, hopefully ushering in a new understanding of this beautiful country… my new home away from home.